This blog is where I will blog about life in my forge making metal forge work to commission and teaching private blacksmithing and creative metal work courses. 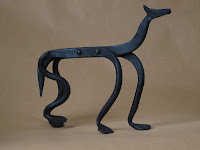 I will also post images of pieces made by visitors on the one-day blacksmithing and creative metalwork courses I run each month from my studio. These courses are aimed at people of all abilities that want to try their hand at working hot metal at the forge, use traditional blacksmithing techniques and take home a finished piece of their own design. You do not need any experience or equipment, I will provide this, you just need an idea and enthusiasm for blacksmithing and sculpture. My courses are best known for teaching traditional blacksmith skills; drawing down points, up-setting, punching, splitting, scrolling and bending and applying those skills to create sculptural pieces or traditional ironwork. The day starts with forging a simple 'S' Hook from round bar where you learn how to keep the forge fire, using an anvil and hammer effectively, drawing down a point and creating a bend. The rest of the day is spent making your own piece of work.